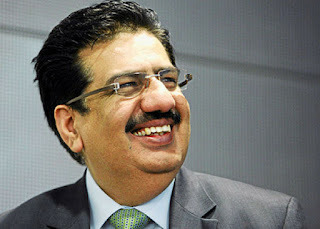 Musings 'n scribblings of a philanthrope .. : The life of a dynamic Indian manager - Vineet Nayar .. The life of a dynamic Indian manager - Vineet Nayar ..
Born in Pantnagar on the foothills of the Himalayas, now called Uttarakhand, Vineet Nayar is a product of XLRI, Jamshedpur and one of its famous alumni. A great HR man, former CEO and VC of HCL Ltd, present Chairman of Sampark Foundation , who has managed to motivate people and organisations by the power of people, XLRI founder Director Fr. McGrath should be proud of this famous alumnus. Click here for a great talk where he motivates people to go out and do the best ..
Do not try to manage people, inspire them to achieve greater goals and objectives. Discuss not the problem, but the opportunities ..
His best-selling book "Employees, first, Customer second" is a gem for HR managers around the world. A people person to the core ..